As an editor- in- chief for Chopcult, I am bombarded with e-mails and requests to feature motorcycles and their owners stories. I received an e-mail from a Texas native named Jason Ochoa, which included a few pictures of his very clean custom 1976 XLCH Ironhead, and I knew this is a bike Chopcult enthusiasts would enjoy. 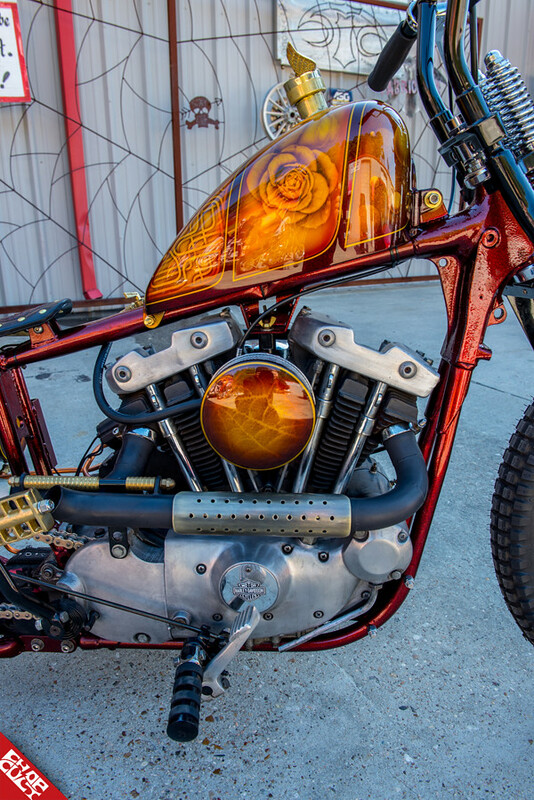 This bike is an extension of Jason’s personality and although the theme of the bike may not settle well with some radicals, it is undeniable that the overall attention to detail and custom work are what sets some bikes apart from the crowd. This bike was built over the course of a year and I learned a lot from friends and other local bike builders during the process. I had an opportunity of working with a local shop in Fort Worth, Texas and the two owners taught me new ways of fabricating and using a lathe for the first time to make some cool brass pieces and other custom parts used on this bike. It was a humbling experience and I would not trade the time spent on this bike for anything. This started as a vision I had long ago and when I had an opportunity to buy this bike at a dirt cheap price, I jumped on the deal. I was able to slowly piece together my ideas for this build with the help of friends and some talented custom builders, I was able to achieve my vision into the final version of the bike you see here. The first thing I did was strip the bike of the motor and took it to my friend Daron Thomas to go through it and freshen up anything that needed some attention. While the motor was out, I stripped the entire bike of all the things I knew would not be re-used. I sold those parts and used the money I made to fund the build. I purchased a bolt on hard tail for next to nothing and after seeing it on the bike I knew I had to go a different direction. The local shop and I came up with some cool ideas to modify the hard tail section by making some custom gussets to add strength and some custom touches. After some hand made parts where cut, drilled and shaped, we were able to turn the bolt on section into a one off weld on section. The next thing was to decide on a rear fender and tank style I wanted to use for the bike. I used the original front fender for the rear section of the bike. After some hand manipulation and bending I was able to obtain the look I was going for. As for the tank, I ordered a STR Tank from Pandemonium Choppers that fit the style of the bike overall. The next thing on the list was to determine a wheel style. I had originally turned to spoke wheels, but decided on some Invader wheels when I found a set for dirt cheap on Craigslist. I had no idea how they would fit the look of the bike, but in the end, they made the look of bike more aggressive. There is a ton of custom one off pieces that were fabricated on this bike and some added attention to detail items that a true bike enthusiast could appreciate. This bike was built for me and no one else, so I understand some people will have their opinions on the bike. Love it or hate it, but appreciate the hard work and dedication put into the final product. Frame: Modified bolt on Santee hard tail with custom gussets and framework. Tire/wheel size and style: 16” rear original 70’s invader with a front 21” inch Invader reproduction wheel from No School Choppers. Favorite thing about this bike: This bike is small and tight just the way a lane splitter should be. Overall, this bike is a blast to ride and has very comfortable riding stance. I really love how some of the smallest details on this bike makes it stand out. 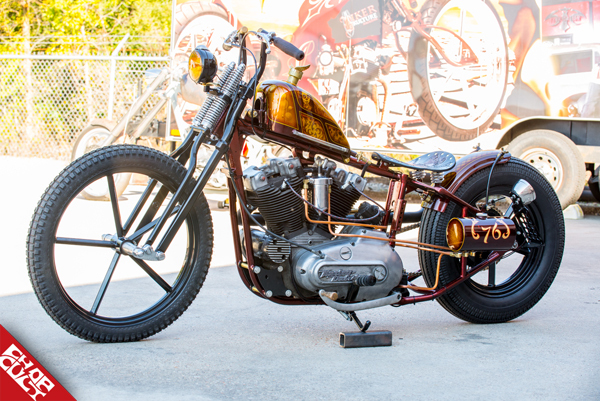 If you know what you are looking at then you can truly appreciate all of those details such as the way the pipes mount with accented brass pieces and brass cane handle converted into the shift peg along with many other hand made custom parts on the bike. Other mods, accessories, cool parts, etc: The bars were bent and welded to the top tree clamp while keeping a tight and narrow design. The exhaust is also one off made along with the fabricated heat shields. A side mounted oil bag and mounts were also fabricated up for a different look. The tank has been modified to accept a reproduction model T radiator winged cap. Also, custom struts, tank mounts, and battery box were custom made to achieve the look I was going for. Thanks: To my friend Gary Queen at www.othersidecustoms.net for the awesome paint job. Daniel Sanchez of www.ctcfab.com for assisting with fab work and other local shops and friends in the Dallas/Fort Worth area for assisting and lending a hand during the build time. Oh yeah, I saw this bike featured in The Horse mag. Good looking bike with a lot of nice, handmade details for sure. Maybe a little overdone/too ornate for my taste but for sure a lot of work put in on it. Normally I'm not a fan of airbrushing on tins and even though it's busy, the tank still looks great. Love the primary cover as well. Nice job. Hope to run into you at an event some time, Jason. I love this bike, I could see how people could hate the theme but at the end of the day it is a beautiful build. Love all the little bits, especially the shift nob! What's not to love about this bike? Super clean. I'm a sucker for invaders, that front end is perfect. Looks like a killer machine to me. Great job! That's def how you make a DNA look better! Spot on! The bars the color the stance.. Real nice piece of ridable Art! There's a lot of detail in this bike. Definitely not something that just gets a walk by glance. Nice build, man. Hope to see this bike in person one of these days. Much respect for the craftsmanship of this build. Top shelf. I wish I had half his skills! Can't wait to see the next build. i love seeing ironheads done up all pretty. great build man. Man, your scooter just works from one end to the other, it speaks to my Hispanic Soul, well done my Brother!